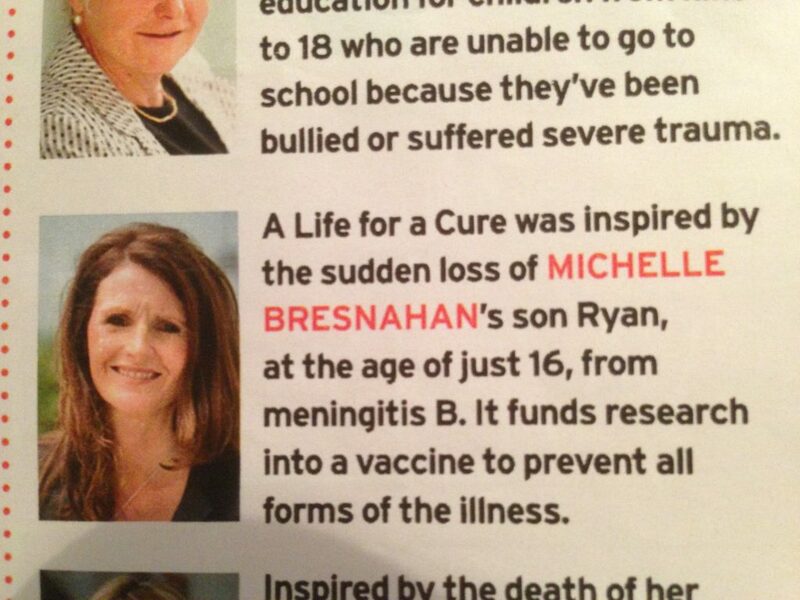 Michelle Bresnahan has been shortlisted for the prestigious Clarins Most Dynamisante Woman of The Year award. I was very excited to receive a letter from Clarins inviting me to attend an interview at the Charlotte Street Hotel in London on Wednesday 17th April 2013 and represent the work we are doing for ‘a Life for a Cure’. I was a bit cheeky as I asked my dear sister Sally Carter, Ryan’s Godmother, to nominate me after seeing an advert for the award in The Mail on Sunday YOU magazine. Clarins set up the award 12 years ago to recognise dedicated women who commit to improving the lives of children around the world – the prize was £30,000 so thought it was worth a try! Sally is and always has been an amazing sister and has been unconditionally supportive to us before and after losing Ryan – not to mention contributing £10k towards Ryan’s total from her own fundraising. Whatever she said worked , as I was shortlisted amongst 1500 nominations to ‘go through to the next round’! 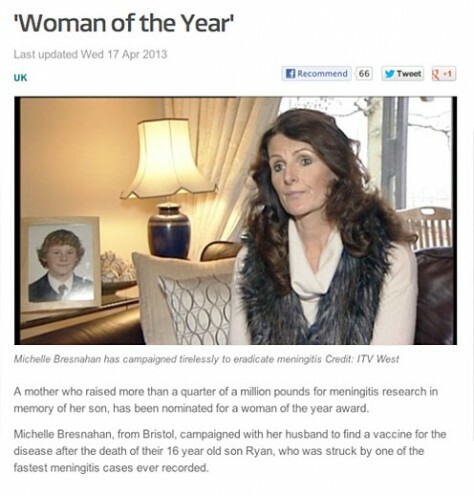 The day of the interview soon arrived and I was looking forward to sharing Ryan’s story with the judging panel and our aim to find the ultimate vaccine to stop all forms of Meningitis. The hotel was stunning and the staff of Clarins and YOU magazine were very friendly and interested in each of the candidates stories. Shoshana Gillis, Head of Press and PR of Clarins, Catherine Fenton YOU Magazine’s Deputy Editor and Jo Fairley were ready to listen to my story of the last 3 years. The interview was pretty gruelling as I was questioned about decisions we had made following the tragic death of our amazing Ryan – which had never happened before. I left feeling a little bit scarred but on reflection, it has only reinforced in my mind that some good MUST come of losing Ryan and has enriched my approach to the work that I do. The next day I was surrounded by support and words of encouragement and secretly chuffed to see myself on an internet news feed beating the headline that Gary Barlow had driven through Bristol in a pink Rolls Royce with Chris Evans! Everyone has a right to their moment of fame – this was mine! 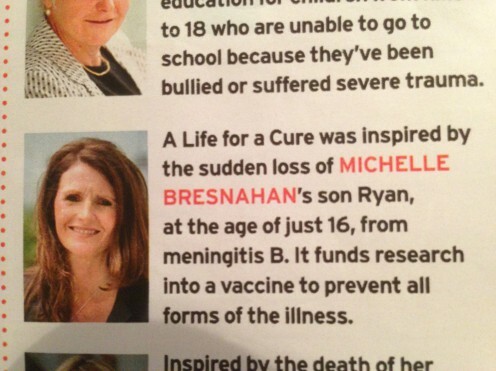 Nicky Goulder of Create won the award as announced in YOU Magazine on 16th June. Clarins were very kind and sent a donation of £1,000 to Ryan’s Appeal as a runners up prize!! It would have been amazing to win and receive the £30,000 to fund additional research, but I learned sooo much from the whole experience, had the opportunity to share Ryan’s story with three strategic women, had a day in London and lovely meal with my sister Mary at Paddington. « Meningitis B Major breakthrough!